Despite reforms during the crisis, EMU remains in the middle of the river. There is by now consensus in both political circles (see the Rome Declaration of March 2017) as well as academic ones (e.g. Enderlein, Letta et al. 2016, Bénassy-Quéré and Giavazzi 2017) on the need to take further steps to complete EMU. There are, however, still diverging views on the problems that need to be overcome and, partly as a consequence, on the measures to be taken. Against this background, the Commission has re-launched the debate, with a Reflection Paper on the deepening of the EMU (European Commission 2017).1 It builds on the proposals in the Five Presidents’ Report (Juncker et al. 2015) and suggests a series of concrete steps on how to complete EMU by 2025. But it also marks an important shift in one important aspect: the need for a better balance between common tools for shock absorption (i.e. risk sharing) and a greater role for markets as incentives for fiscal and financial discipline (i.e. risk reduction). Despite the progress in recent years, EMU today continues to rest on an unsustainable equilibrium (Figure 1): the incomplete nature of the financial union (banking union and capital markets union) and the absence of a fiscal stabilisation function for the Eurozone as a whole imply insufficient mechanisms for the absorption of shocks (both via private and public channels). At the same time, the combination of the current asymmetric nature of the surveillance processes – which put more emphasis on correcting fiscal or external deficits and have less influence on how to handle significant surpluses – coupled with the absence of a central fiscal stabilisation mechanism means that it is impossible to achieve simultaneously an appropriate fiscal stance for the Eurozone as a whole and an optimal distribution of the fiscal effort enabling the right balance to be struck between stabilisation and sustainability at the national level.2 This combination leads to an overburdening of monetary policy for stabilisation purposes and an inappropriate policy mix, especially at the zero lower bound for policy interest rates. This equilibrium is even more precarious as high debt and insufficient reforms in several countries make them vulnerable and hamper adjustment, within and across countries. In addition, it has been achieved as the product of several 'ultima ratio' decisions, with agreements often partial and not entirely owned by all the sides. There is no consensus on the way forward. The debate so far has been dominated by two main camps with significantly different views on the interplay between solidarity and responsibility, risk sharing and risk reductions, with tones so strong that this has been dubbed “a battle of ideas” along the "Rhine-divide" (Brunnermeier et al. 2016a). One camp calls for a 'return to Maastricht', entailing the strict implementation of a rules-based fiscal framework with sanctions, the re-affirmation of the no-bailout clause, and an emphasis on risk reduction. The other camp highlights the need for smarter rules with greater discretion, accompanied by the introduction of common risk-sharing instruments, both public and private. But solidarity and responsibility should in fact be seen as two faces of the same coin and should be addressed together by finding a balanced agreement on the way forward. Building bridges between the two polar options is important, not only from a political, but also from an economic and financial perspective. Without appropriate risk-sharing arrangements, risk reduction – namely, in the financial area – may actually result in higher risk of market instability. Conversely, risk sharing without an effective risk reduction strategy would enhance moral hazard and ultimately increase risk. The Reflection Paper therefore attempts to bridge the two dominant narratives by identifying realistic and desirable solutions on which agreement can be more readily found in the short term, while acknowledging that some other elements needed for the successful completion of EMU could be delivered over the longer run. A new institutional balance will also be needed, for example combining integration or centralisation in some policy fields with more margins for manoeuvre in other fields (Pisani-Ferry 2015). 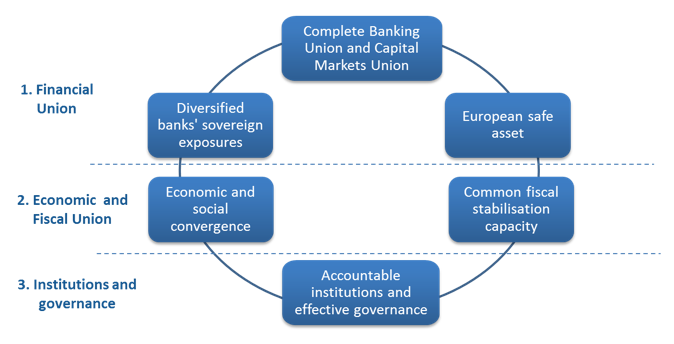 The Reflection Paper proposes to advance in three areas: first, completing a genuine Financial Union; second, achieving a more integrated Economic and Fiscal Union; and third, strengthening Eurozone institutions and accountability (Figure 2). An integrated and well-functioning financial system is essential for an effective and stable EMU. Building on what has already been achieved in recent years, a consensus needs to be found on the way forward, including implementation of the elements agreed already, deciding quickly on the other elements that are on the table, and agreeing on additional steps to take between now and 2025. While the Banking Union and the Capital Market Union will reduce the stress that the banking sector can create for the public sector, the other direction of the 'doom loop' – from sovereigns to banks –remains only partly addressed. Sound fiscal policies and the reduction of public debts will reduce the risks that sovereign bond developments can generate for banks. However, in the presence of a single monetary policy and full capital mobility, keeping the European financial system based on national bond markets creates the scope for sudden shifts of capital between these markets, which puts at risk the stability (and convergence) of the Eurozone (van Riet 2017). Greater diversification of banks’ balance sheets would help to address the problem of interconnection between banks and their ‘home country’. The Reflection Paper suggests that one possibility of promoting more diversification could be the development of so-called sovereign bond-backed securities (SBBS), as explored by Brunnermeier et al.(2016b). Nevertheless, the Reflection Paper acknowledges that SBBSs are unlikely to become sizeable enough to become the benchmark for European financial markets with the potential to be comparable to US treasuries or Japan's government bonds. A possible reform of the regulatory treatment of sovereign exposures (RTSE) has been raised in the discussions on how to deliver the Banking Union as an additional measure to sever the bank-sovereign loop. Several options have also been considered to that end (ESRB 2015). However, a possible reform of the RTSE could only be considered once the Banking Union is completed with a functioning backstop to the Single Resolution Fund and a common deposit insurance, and a suitable common European safe asset is in place (and changes to RTSE should be compatible with and supporting it). In addition, such a reform should be coordinated at the global level to ensure a level playing field. Experience has shown that at times of stress, the current structure of the sovereign bond markets in Europe, and the large exposure of banks to their national sovereign, have amplified market volatility, affecting the stability of the financial sector and the real economies of the Eurozone member states. Hence, to fully eliminate the 'doom loop', a more ambitious solution changing the structure itself of the European bond markets is necessary. This would require, in the medium term, the development of a genuine Eurozone safe asset (Moscovici 2017). That will also help develop a Eurozone yield curve, important to facilitate both the conduct and transmission of the monetary policy and foster long-term investment and risk capital. It is also essential that the Eurozone be equipped with an asset class that matches more closely the weight of its economy, and offers an alternative investment opportunity for third countries currently investing in the EU mainly in equities. A truly European safe asset should preserve the capacity of governments to finance themselves at reasonable costs and with continuous market access, but at the same time it should improve the incentives for sound budgetary policies. To deliver its full potential, first, the European safe asset should carry the lowest possible credit, market, liquidity, contagion, and supply risks – compared to other such assets in Europe and globally – and have a sufficiently transparent structure to allow investors to price it with ease and to be considered of the safest standard. Second, the European safe asset should be sizeable enough to become the reference bond for collateral and liquidity purposes in the Eurozone and to meet global demand. Third, it should encompass a wide maturity structure that can serve the objectives of various investors, including those with a very long-term horizon. In recent years, several proposals have been put forward with different design features to create a European safe asset, ranging from full to partial or common issuance, some based on mutualisation and others entailing no joint liabilities (European Commission 2011). Figure 3 illustrates the various options put forward in the literature and how they fare in the trade-off between liquidity, stability, and governance on the one hand, and incentives and discipline on the other hand. 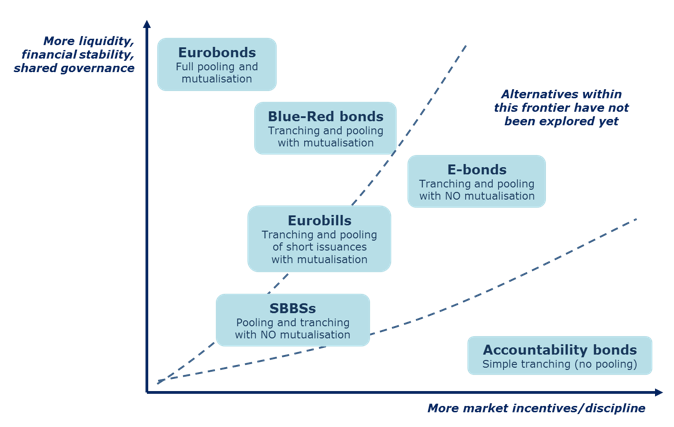 Eurobonds – with full mutualisation of liabilities – have significant potential benefits in terms of size, liquidity, and pooling of risks, but could have large drawbacks in terms of distribution of legacy debt and incentives for future national policies. Partly mutualised common issuances such as the "Blue Bonds" (von Weizsäcker and Delpla 2010) could attenuate both positive and negative effects of a full mutualisation. Pooling of sovereign bonds and tranching of the common issuance – as the SBBS mentioned above – could avoid mutualisation by shifting all risks to private holders, but may not be sufficiently sizeable. A reverse approach – doing first the tranching of sovereign bonds and then the pooling of the common issuance within a reasonable size – would also avoid the transfer of risks and mutualisation across member states.4 Proposals of this type include E-Bonds (Monti 2010) and the Eurobills (Philippon and Hellwig 2011, Bishop 2013). Any further reflections in this area – which has been announced by the Commission – would need to focus on the necessary features of such an instrument, to make potential benefits materialise. The Five Presidents' Report (along with others, such as Enderlein, Letta et al. 2016) already recognised the convergence towards more resilient economic and social structures in member states as an essential element for a successful EMU in the long run. There exist several instruments that could be used better to achieve this goal, such as: (i) strengthening coordination of economic policy under the European Semester; (ii) reinforcing links between national reforms and existing EU funding; and (iii) further developing technical assistance to member states to support capacity development. Convergence towards resilient economies – able to withstand shocks and recover quickly to potential – is fundamental for improving the functioning of EMU. The experience of the past years has shown how lack of resilience in one or several economies of the Eurozone can have persistent effects not only on those countries concerned, but also on other member states and the Eurozone as a whole. Resilience also fosters cyclical convergence and the effectiveness of the single monetary policy. Ultimately, policies identified as having a material impact on economic resilience in EMU could become part of the convergence standards – advocated by the Five Presidents' Report and the Reflection Paper. Compliance with these standards would be a requirement to access the new stabilisation capacity. The concept of Fiscal Union being intimately connected to national sovereignty creates strong emotional reactions. In reality, a minimalistic interpretation is warranted, without transfer of competences in the areas of allocation and distribution, which would remain under national control. The Fiscal Union could be built on a set of fiscal surveillance rules codified in a simplified Stability and Growth Pact, on a fiscal backstop for the Single Resolution Fund, and on a stabilisation capacity. A European Investment Protection Scheme would protect investment in the broad sense, in the event of a downturn by supporting well-identified priorities and already planned projects or activities at national level, such as infrastructure or skills development. A rainy day fund could accumulate funds on a regular basis. Disbursements from the fund would be triggered on a discretionary basis to cushion a large shock. The rainy day fund, however, would normally limit its payments strictly to its accumulated contributions. Stabilisation from these instruments should be delivered in the case of large shocks – it should not be a fiscal fine-tuning exercise. To increase its stabilisation effects, the function should be equipped with the capacity to borrow. This would need to be accompanied by a design that clearly provides for savings at other times and limits indebtedness. Finally, a Eurozone budget could ensure broader objectives, covering both convergence and stabilisation, and would need a stable revenue stream. More importantly, though, it implies a more significant transfer of competences to the European level. It is therefore a far-reaching option for which further integration progress would seem needed before it can become a concrete possibility. For EMU to be stronger, member states must accept to share more responsibilities and decisions on euro area matters, within a common legal framework. There is a need for a “quantum leap in institutional integration” (Draghi 2015). Completing the EMU means greater democratic accountability and higher transparency about who decides what and when at each and every level of governance. The European Parliament and national parliaments need to be equipped with sufficient powers of oversight, including by extending and formalising the dialogue between the European Parliament and the other institutions acting on behalf of the Eurozone, starting with the Eurogroup, whose members remain accountable to their national parliaments. Further political integration could involve a rethinking of the functioning of the Eurogroup as a formal and more transparent decision-making body and could justify the appointment of a full-time, permanent Eurogroup chair, which could be merged with the Member of the Commission in charge of EMU. The unification of the Eurozone's external representation should also proceed. Several competences and functions could be regrouped under a single umbrella provided by the Eurozone Treasury, as the institutional envelope for the functions of the Fiscal Union, within the EU framework. The Treasury – possibly with a Eurozone budget – could be responsible for the economic and fiscal surveillance, the macroeconomic stabilisation function, and the issuance of the European safe asset (including all issuances currently made by European institutions). The European Stability Mechanism (ESM) in its current form provides liquidity assistance to member states and in the future could act as a common backstop to the Banking Union, which needs to be put in place as soon as possible. The ESM could evolve into a European Monetary Fund (EMF) to give the Eurozone more autonomy from other international institutions when it comes to financial stability. Different possible designs can be envisaged in the more general framework of the possible creation of a Eurozone Treasury. For instance, the EMF could be the financial stability arm of the Treasury. As a pre-condition, it is important that the ESM or this evolved EMF is integrated into the EU legal framework to improve the efficiency of its decision making and to allow adequate oversight by the European Parliament. Overall, these institutional changes would be an important development which could take place at a later stage of the deepening of EMU. We have highlighted a number of key elements in the Commission Reflection Paper, and developed the reasoning behind them. All the ideas face their own challenges and criticisms, which, as expected, have been aired again after the release of the paper. But when the various options are considered as a comprehensive package, their merits are more evident and their limits more nuanced. Besides the choice among options for deepening EMU, what is key is an appropriate sequencing for their implementation. The Commission proposed to move forward in two steps: a first phase, which runs to the end of 2019; and a second phase, over 2020-25, for completing the EMU architecture. A window of opportunity for forging a consensus and delivering concrete steps is opening now – with the approaching completion of the electoral cycle in the main member states of the Eurozone – and will likely close around the end of 2018, when the final stage of the mandate of the European institutions approaches. This period will also coincide with the timeframe expected by markets for the end of the accommodative policy of the ECB, which could – in the absence of further steps to deepen EMU – expose once again the vulnerabilities still faced by some Eurozone countries. This is a relatively short timeframe in the face of the typical pace in the history of European integration. But it could be sufficient to provide the needed momentum for discussing and agreeing a comprehensive package, and set the basis for launching Treaty changes required by several key reforms to complete EMU. The first reactions to the Reflection Paper are cautious but appear constructive. This window of opportunity should not be missed. Beblavy, M and K Lenaerts (2017), “Feasibility and Added Value of a European Unemployment Benefits Scheme. Main findings from a comprehensive research project”, European Commission Directorate-General for Employment, Social Affairs and Inclusion. Bénassy-Quéré, A and F Giavazzi F (eds) (2017), Europe’s Political Spring: Fixing the Eurozone and Beyond, A VoxEU eBook, CEPR Press. Bishop, G (2013), "Bolstering the Still-Fragile Euro: A Plan for a Temporary Eurobill Fund". Brunnermeier, M, H James and J-P Landau (2016a), The Euro and the Battle of Ideas, Princeton University Press. Brunnermeier, M, S Langfield, M Pagano, R Reis, S Van Nieuwerburgh and D Vayanos (2016b), “ESBies: Safety in the Tranches”, ESRB Working Paper No. 21, September. Corsetti, G, L P Feld, P R Lane, L Reichlin, H Rey, D Vayanos, and B Weder di Mauro (2015), A New Start for the Eurozone: Dealing with Debt, Monitoring the Eurozone 1, CEPR Press. Draghi, M (2015), Speech at SZ Finance Day 2015, Frankfurt am Main, 16 March. ESRB (2015), "ESRB report on the regulatory treatment of sovereign exposures", March. European Commission (2017), Reflection paper on the deepening of the Economic and Monetary Union, COM 2017(291), 31.5.2017. Fuest, C, and F Heinemann (2015), "Accountability Bonds: Das Ausmaß der gemeinsamen Haftung eindämmen", Euractive, 5 ‎Mar‎ch. Gros, D and T Mayer (2010) "How to Deal with Sovereign Default in Europe: Create the European Monetary Fund Now! ", CEPS Policy Brief No. 202. IMF (2013), “Toward a Fiscal Union for the Euro Area”, IMF Staff Discussion Note, SDN/13/09. Juncker, J.C. (in cooperation with Tusk, D., Dijsselbloem, J., Draghi, M. and Schulz, M.) (2015), Completing Europe’s economic and monetary union. Five Presidents’ Report. Monti, M (2010), "A new strategy for the single market", Report to the President of the European Commission José Manuel Barroso, pp. 61- 65. Moscovici, P (2017), “Towards enhanced cohesion, integration and prosperity”, Keynote speech at the Brussels Economic Forum 2017. Philippon, T and C Hellwig (2011), "Eurobills, not Eurobonds", VoxEU.org, 2 December. Philippon, T (2015), "The state of the monetary union", VoxEU.org, 1 August. Pisani-Ferry, J (2015), "Rebalancing the governance of the euro area", France Stratégie, Document de travail No. 1, May. Thirion, G. (2017), “European Fiscal Union: Economic rationale and design challenges”,, CEPS Working Document No. 2017-01.
von Weizsäcker, J and J Delpla (2010), "The Blue Bond Proposal", Bruegel Policy Brief 2010/03. The paper follows up the European Commission's White Paper on the future of Europe (COM 2017(2025), 1.3.2017. This dilemma was discussed by the European Commission (2016). Another important aspect, although not discussed in the Reflection Paper, concerns changes to the current set up for the provision of emergency liquidity assistance (ELA). This is still provided by national central banks, albeit after authorisation by the ECB. In our view, there should be symmetry between the level at which the ELA is provided and at the level at which supervision is carried out. This means that for banks under the SSM supervision, which would be typically operating across Eurozone countries, the responsibility for providing ELA should be at the European level, by the ECB. Tranching of national issuances could be done, for example, by maturity (national issuer does not cover specific maturities), creditor ranking (national issuer provides seniority to the common issuer), or ranking among bond issues (national issuances are divided into junior and senior bonds and the common issuer only pools the latter). Proposals which follow an approach of just 'tranching' without pooling, such as "accountability bonds" (Fuest and Heinemann 2015), are not able to deliver a European safe asset. Some academics have been arguing that a truly credible framework requires not only changes in the RTSE, but also a mechanism which delivers a default of sovereign debt, possibly linked to a strengthened sovereign lending framework for the ESM (Gros and Meyer 2010, Corsetti et al. 2015). However these steps could backfire even if a full set of pre-conditions to ensure financial stability would be in place, as they could generate self-fulfilling prophecies. The case and proposals for a Fiscal Union are also made in, for example, IMF (2013) and Thirion (2017). For overview of the discussions on a stabilisation mechanism based on unemployment benefits see, for example, Beblavy and Lenaerts (2017).